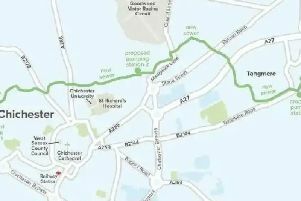 Two new footbridges over the A27 are to be built on completion and occupation of 300 homes at a development in Shopwhyke. The development at Shopwhyke Lakes also determine when the Oving Crossroads is closed to traffic. Simultaneous construction and the closure of the Oving crossroads will mean roadworks over a period of around 11 months, developer Cala Homes explained, ‘rather than several years’. Cala Homes, which is building 500 homes at the site, was obliged to build a footbridge over the A27 between Oving and Westhampnett on occupation of 124 dwellings. The developer has now finished 83 homes but planning officers have agreed to delay the condition after Highways England revealed sight-lines on the dual carriageway required the bridge be constructed at the same time as a second footbridge at Portfield business park. Approving the amendments, planning officers wrote: “It has become apparent more recently that it would be highly advantageous to undertake the construction works to the A27(T) in a seamless fashion designed to ensure road safety and to minimise disruption to the network over a shorter period of time thus improving overall highway safety to all road users. Conditions for a controversial interim solution at Oving Crossroads for a ‘left-in left-out’ solution have been removed. The Crossroads will change directly to a pedestrian crossing controlled by traffic lights. Oving Parish Council, which has campaigned for several years to prevent the closure of the Oving Crossroads, supported the changes apart from those relating to closing the junction.